This project is one of many that has ties with Williams Selyem. Three young Pinot amigos, who had worked together as cellar hands at the distinguished winery on Westside Road launched their own winery with three Pinot Noir releases in 2004. David Low, Anthony Filiberti and Webster Marquez hit the road after harvest ended in 2003 at Williams Selyem and toured wineries in Oregon's Willamette Valley. The idea of forming their own winery hatched on that trip. Anthony Filiberti grew up in Sonoma County and was lured to wine at an early age. He learned winemaking at Bergstrom Winery in Newberg, Oregon, Hafner Vineyards in the Alexander Valley, and Williams Selyem. David Low grew up in Kansas but got hooked on wine while attending University of California Berkeley. A short stint as a computer programmer was followed by a change of heart and he later worked at both Williams Selyem and Papapietro Perry. 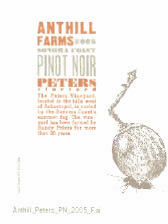 Low is now an assistant winemaker at Papapietro Perry Winery. Webster Marquez grew up on the East Coast and attended college in Virginia. 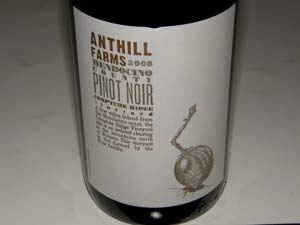 Here he began working as an assistant winemaker at Jefferson Vineyards. He then moved to Sonoma County where he joined Williams Selyem. 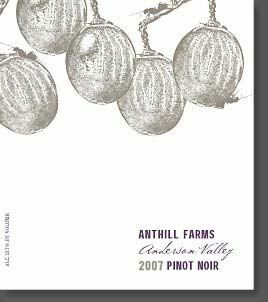 Currently he is the winemaker at C. Donatiello Winery in Healdsburg. The trio’s goal is to craft Pinot Noirs that “express the growing site and the characteristics of the vintage, and above all else, taste good.” They disdain the riper style of Pinot Noir, looking more for freshness of flavor and acidity. Some whole clusters are included in the winemaking. New oak is limited to about 30%. Racking, fining and filtering is avoided. 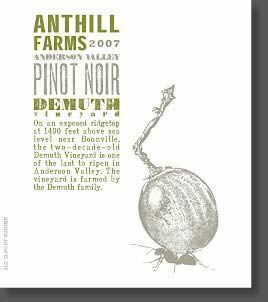 The emphasis at Anthill Farms is on the vineyards and have named their winery Anthill Farms to emphasize the many tiny individual vineyards that form “the link between place and product.” The trio avoid calling attention to themselves, preferring to bring notoriety to their winegrowers. 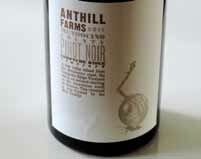 Their grape sources are North Coast vineyards in Sonoma and Mendocino counties. They also farm a small vineyard named Abbey-Harris high above Boonville in the Anderson Valley. 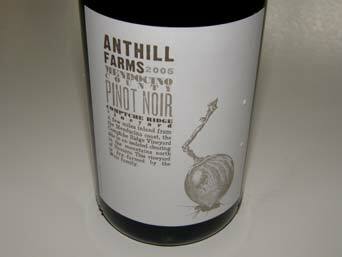 The annual production of 1,400 cases is quickly snapped up by a mailing list. 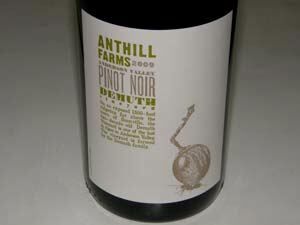 Anthill Farms Winery is located at 4791 Dry Creek Road, #3-4, Healdsburg (in the Papapietro Perry winery). 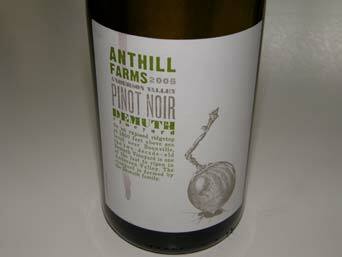 Tasting by appointment - phone Dave at 707-490-5191 or e-mail Webster at webster@anthillfarms.com. 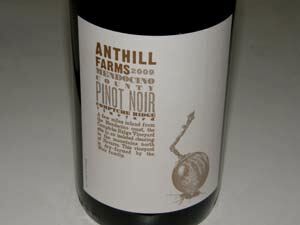 I have been a big fan of the Anthill Farms Pinot Noirs since the first release and find them consistently in the top tier of producers in the Russian River Valley.